Bradley Wiggins has responded to suggestions from former team-mate Chris Froome that he couldn't trust him during the 2012 Tour de France. 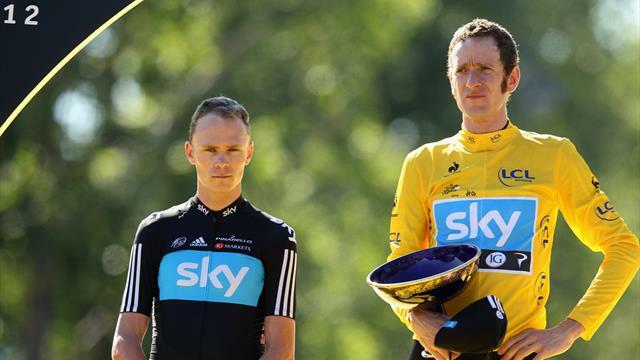 Froome made headlines this week when he said that "the difficult part for me was trusting him as the leader" in the 2012 race, which Wiggins eventually won, following the Vuelta of the previous year when the Team Sky leader fell away towards the end. Froome, who appeared to attack Wiggins on Stage 11 of the 2012 Tour, said to Nico Rosberg on the former F1 driver's podcast: “There were definitely a couple of moments where I thought ‘right I’m going to go for it now.’ But the team orders and the guys calling the shots in the car were straight onto me and called me back. Wiggins responded to Froome on the latest episode of The Bradley Wiggins Show, available on all major podcast platforms this Monday morning. "I wish he had told me," Wiggins said. "That is Chris's opinion and as I've spoken about in the last few weeks here, that's the world we are all in. Maybe I wasn't the best communicator at the time. The year I'd had a bad couple of days towards the end of the Vuelta: I'd broken a collarbone six weeks earlier, still had a plate in, I couldn't really get out of the saddle properly. I didn't expect to be in that position. "And to be honest, if Chris is being honest as well, he didn't expect to be. He couldn't scratch his arse before that point and found himself second in the Vuelta with a week to go. "And at the start of the race, Dave [Brailsford] is coming to me saying 'I don't think we are going to sign him next year, what do you think Brad?' and I said, 'well he has proved himself here in the team time trial so I think you should keep him, we know he has got an engine'." "So I think that's the way teams work. It's all a bit incestuous and no one really communicates. I will be the first to admit I wasn't the best team leader in the world so communication wasn't my strong point, and we found ourselves second and third going into the last couple of days of the Vuelta Espana and it was the point for him which leaped his career forward and gave him the confidence to do what he did. "But as I say, I'm not going to sit here and slag him off because I think he's a great athlete and this, that and the other, but that is the world you are in at that time and I take responsibility for it, but it is what it is." "That year I hadn't lost a race either. I did win Paris-Nice, Romandie, Dauphine - I hadn't lost a time trial all year and I was leading the Tour by three minutes going into the last couple of days with a 55km time trial. There were no signs I was going to crack - I hadn't cracked all year. I didn't have a broken collarbone. "So maybe, yeah (it was unfair). I don't want to get myself into too much trouble because you know what the media are like, but that was it really. I did win."